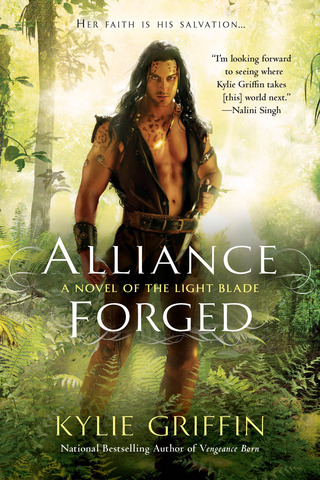 Today's review is of Alliance Forged by Kylie Griffin. This is book #2 in the Light Blade series. In just over 1 month, book #3 in the Light Blade series, Allegiance Sworn will be coming out. The date is April 2nd. If you haven't read the first book in the Light Blade series, Vengeance Born, head over to my review of it here http://mrsclaresbooks.blogspot.com/2013/02/vengeance-born-by-kylie-griffin.html and then read it before you get started on this review. Varian is the leader of the Na'Chi that found their way to Sacred Lake, the human village. He is very reserved and stoic as he's had to protect his "family" his whole life. The other Na'Chi depend on him for survival. Varian also has scars on his face, which he feels makes him undesirable. Kymora is the Temple Elect and she is blind. However, she never lets that stop her. After the events of Vengeance Born, the humans and Na'Chi wish to learn how to live in peace. Some of the Na'Chi stay in the village and some of the humans move up to the caves with the Na'Chi. Kymora decides it is her path to go live with the Na'Chi. The alliance is tumultuous at best, but everyone understands that in order to have any chance of defeating the Na'Reish, the Na'Chi and the humans must align themselves with each other and forge a bond. Caught in the middle of this are Varian and Kym. For all of Varian's hardness and unwillingness to show his feelings, he is somehow drawn to Kymora in a way he doesn't understand. Kymora is also unschooled in the ways of romance and finds herself longing for something with Varian. But can she break into his seemingly hard heart and make him trust her? There are things about Varian's nature that frighten him and he worries that Kymora will be a victim to his rage. Kymora has always felt that nobody believes she can take care of herself because of her blindness, but her unwavering trust in Varian may just give him the healing he needs. This book was fantastic! Even better than the first. The chemistry and sexual tension was unbelievable! My heart was racing the entire time wondering how this ticking time bomb hadn't exploded yet. It'll be a hard one to beat, since it surrounded my 2 favorite characters of the series, but I'm sure Kylie Griffin will come through. 5 out of 5 stars! Don't forget to mark your calendars for Allegiance Sworn on April 2nd!